The Chick-fil-A College Football Hall of Fame teamed up with the airline with Heart to give free admission to football fans during Southwest® Sundays, the first Sunday of every month. Get your game day crew together to celebrate the traditions, passion and pageantry of college football with high-tech exhibits and content personalized to your favorite team. Fasten your seat belts, make sure your tray table is secure and enjoy the ride with special experiences for fans during Southwest® Sundays. Score giveaways, play trivia for a chance to win prizes, take photos with the Hall’s mascot Fumbles, and dance to live music from Atlanta family favorite DJ Willy Wow! The first Sunday of the month for April, May and June. DJ Willy Wow performance from 12 p.m. – 3 p.m. and Fumbles appearances during the afternoon. Chick-fil-A College Football Hall of Fame is located at 250 Marietta Street, NW, in Atlanta. The Chick-fil-A College Football Hall of Fame is a 94,256-square-foot attraction located in the heart of Atlanta’s sports, entertainment and tourism district. Adjacent to the Georgia World Congress Center and Centennial Olympic Park, the Hall provides visitors with a highly immersive, interactive and engaging experience using a blend of historic college football artifacts and state-of-the-art, interactive multimedia exhibits. The National Football Foundation (NFF) launched the Hall in 1951 to stand as one of the nation’s premier sports shrines, immortalizing the game’s greatest players and coaches as positive role models for future generations. Atlanta Hall Management, Inc., partnered with the NFF to construct and operate the Hall of Fame attraction, which provides a platform for community outreach, education and character development initiatives, as well as serves as one of Atlanta’s premier special event spaces. 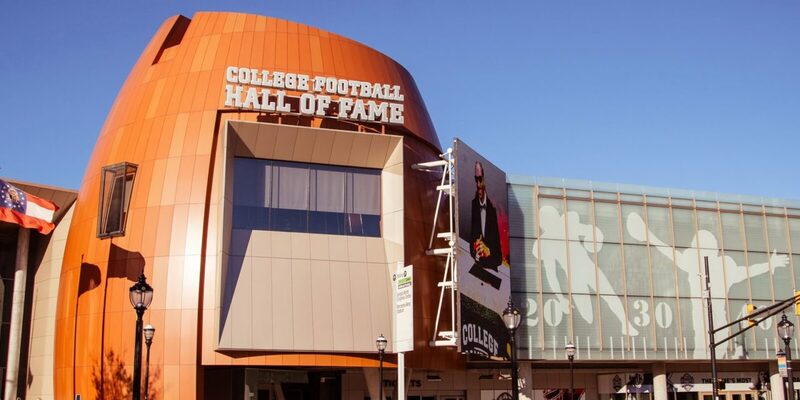 For more information on the Chick-fil-A College Football Hall of Fame, a 2018 TripAdvisor ®Certificate of Excellence recipient, please visit www.cfbhall.com. NextLook Who’s on the Cover! Brian Albrecht, President & CEO of Credit Union of Georgia!